Click the button below to add the Zero Rust 4 Gallon Special (Case) to your wish list. Over Rust: ZeroRust design to be applied over existing rust with minimal preparation. Merely wire brush off any mechanically loose scale or powdery rust. 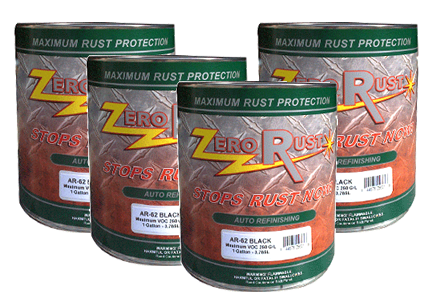 Zero-Rust bites through remaining rust encapsulating it in the phenolic resin system. Scale has air entrapped within its structure and must be removed for maximum protection. Heavy rust scale can be softened for easier removal with the use of Zero-Rust Prep Step . Work the surface as smooth as possible. The smoother the surface and the tighter the remaining rust, the less of product will be needed to cover the pitted surface. With Zero-Rust, no Sandblasting required - Environmental considerations are making sandblasting less viable due to waste disposal and containment.